Father’s Day may be over for another year but research says making Australian dads happy all year is as simple as them having more time with their children. The Australian Institute of Family Studies has found dads who spend more time on child care are the most satisfied with their relationships with their children. Dads also feel a greater bond with their children when they have good relationships with their partner and parents. The research, compiled by Dr Jenny Baxter, draws on data from the Household Income and Labour Dynamics (HILDA) survey. It shows dads with children under 15 spend an average of 13 hours a week on child care, compared to 28 hours spent by mothers. And put your hand up if you’re dreading the teen years? Well, it turns out dads aren’t the greatest fans either. 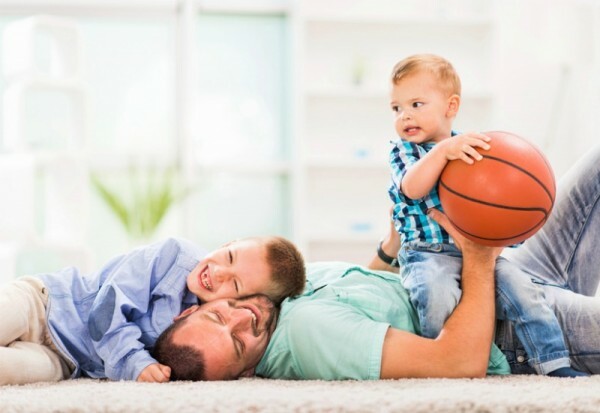 The research reveals fathers are the happiest before their child enters the teen years and become more positive again when their children become young adults. “Fathers of preschoolers are the most satisfied with their relationship with their children,” AIFS director Dr Anne Hollonds told the Herald Sun. The study also found the least satisfied dads spent an average of just 10 hours per week caring for their preschool-aged children. But, before you use this study as an argument for adding to your brood, the research also reveals “having more children equates to fathers putting more time into housework than hands-on child care”. “Fathers with more children spend less time on general child care such as playing with children, helping with their personal care, coaching or taking them to school,” the research reveals.